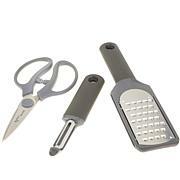 Chef Michael Symon wouldn't go a day in the kitchen without his tongs, and neither should you! 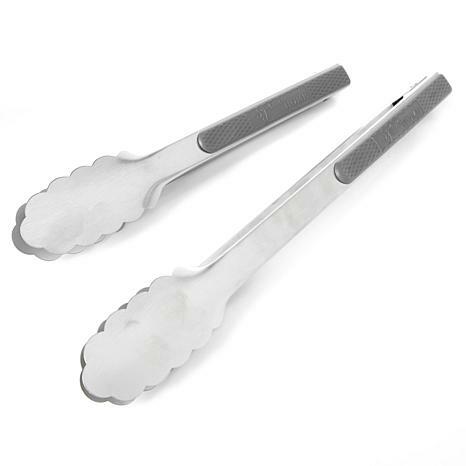 Perfect for sauteing, frying, baking, grilling and more, this tong set makes the perfect culinary companion. 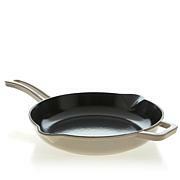 Easily open and close them with just one hand thanks to their self-locking function, and use your other hand to stir the sauce or add a garnish. 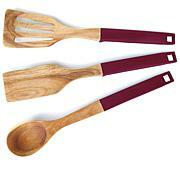 Their textured handles will even help you get the grip you need while you cook. You'll wonder how you ever went without them! I have a draw full of tongs. These are my favorite. I have 2 sets and they are always used. I would love for them to come out with a set of small ones like the small size in this set. Once that happens I will be getting rid of a lot of my others and get more of these. These are awesome !!! The best is you don't have to have a free hand to pull the end out to open and close them. I love simply pointing them up or down to open and close. Great job Symon !!! These are brilliant! So easy to use. Don't need two hands to lock my tongs anymore. I accidentally bought two sets of them. I was annoyed when I realized it, but after I used them I was glad I had two sets. Took me a few minutes to figure out how they open and close, but, one of the good products out there. I use them for grilling only. Im very pleased. These are a little more compact than my other tongs, which I threw out to leave more room in a drawer. I love this set because of the two different sizes. It took a bit of getting used to as to how to open and close them but now I love that I don't have to mess with any locking mechanism and that a simple quick flick of the wrist opens and closes them. I use them all the time. 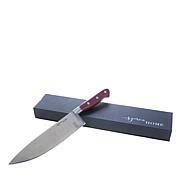 The smaller one is even pretty enough to use as a serving utensil. Based on years of experience at their own restaurants and a lifetime of entertaining at home, Michael and Liz Symon developed Symon Home, a line of cooking and entertaining must-haves to help you create meals you’ll be proud of — and to have fun doing it.